Clean your walkways, patio furniture and car faster and easier than you could with a garden hose alone. 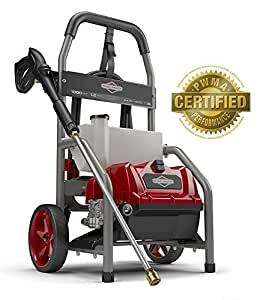 This Briggs & Stratton 1800 Max PSI* electric pressure washer features a turbo nozzle wand and an on-board detergent tank to make quick work of light outdoor cleaning. Plus, wheels and a wide base make it easy-to-maneuver and more stable.